Welcome to Hagley Historical and Field Society website. 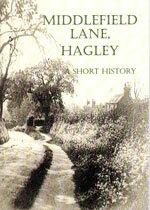 On these pages you will discover something of the history of Hagley and details of our activities. You will find a warm welcome at our meetings which are generally held on the first Tuesday of each month. We enjoy a wide variety of speakers talking on a range of topics relating to the history of Worcestershire, the West Midlands and beyond. Visitors are also welcome to join the full programme of walks and visits. Whilst the majority of our members are happy to enjoy the meetings and other activities, a small group is engaged in active local research; some of their publications may be viewed on this site. 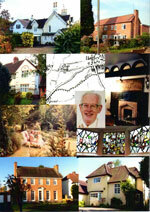 The idea for this new publication was originally developed by the late Dr Peter Bloore, who lived in Middlefield Lane. He was a member of Hagley Historical and Field Society and also Hagley Parish Archivist. His widow offered the file to the Archive Group and they decided that they would continue his research and aim at publishing a summary of his work plus contributions from people, who lived or had lived in the Lane or had first hand knowledge of the residents. The results are now available as an illustrated book of fifty-two pages. The book is priced at £4 and can be purchased from Happy Families or can be ordered online from Hagley History and Field Society. 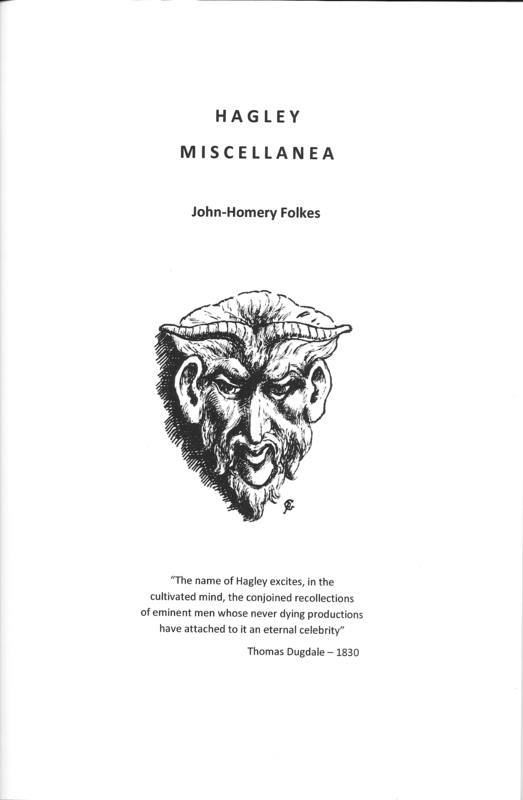 The book “Hagley Miscellanea” by John-Homery Folkes, the architect of St.Saviour’s Hall, was first published in 1974. It was for private circulation and only 25 copies were printed. Forty years later it is considered sufficiently interesting to merit this reprint. The author (born 1906) has gathered a wide range of reminiscences that together give a picture of Hagley’s inhabitants, houses, industries, celebrations and entertainments in the century and more before the explosion of house-building in the 1960s. The book includes: the early days of the railway station; the building of St. Saviour’s church and planning the cemetery; houses large and small; an attempt at encroachment in Church Street; the Rifle Corps and the Range; the nursemaid question! ; Hagley celebrities; the Sunday postal delivery and church attendance and an eyewitness account of the fire at Hagley Hall on Christmas Eve 1925. The “Illustrations” section includes the programme for the Coronation Celebration of June 1911. The book is priced at £5 and can be purchased from Happy Families or can be ordered online from Hagley History and Field Society. 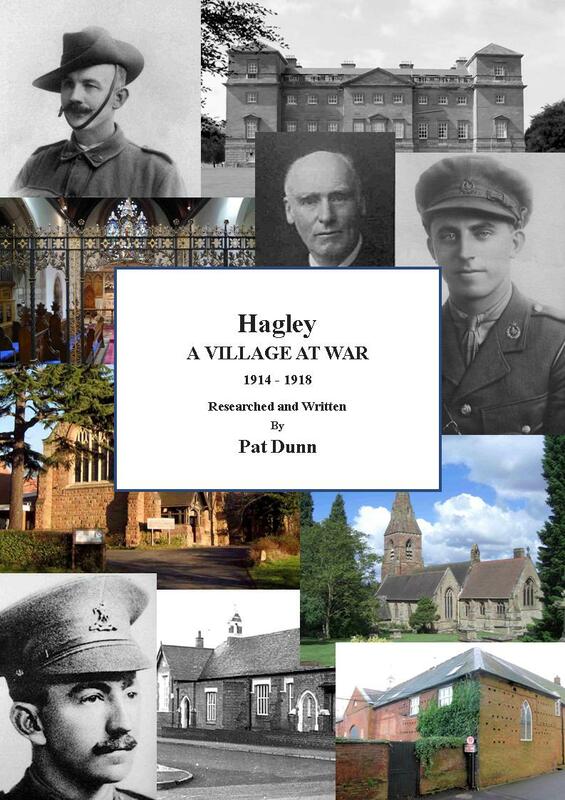 The Society has now launched a new book entitled ‘Hagley: A Village at War 1914 – 1918’, researched and written by local author and member, Pat Dunn. It is based on the ‘Hagley Parish Magazines’ of the period and describes how the people of Hagley dealt with the problems presented by the Great War on the Home Front. The people and places featured on the front cover of June’s issue of the Hagley Village News feature in the book along with many others. The book is priced at £4 and can be ordered online. Click on the book cover below to view the first few pages.